The NEW Resource Center has FREE career tests and social media/career resources for $10! We have developed career test tips to answer some of your common questions. 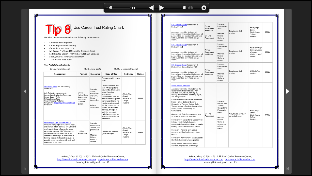 Career guidance booklet provides you answers to your questions. 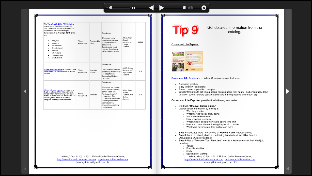 The tips help you find tools to discover your interests, abilities, and skills. Learn about the careers that match your interests. Discover the degree programs that are needed to help you reach your goals. Holland Codes matches personality types to jobs and college majors. There are 16 Career Clusters in the National Career Clusters Model. 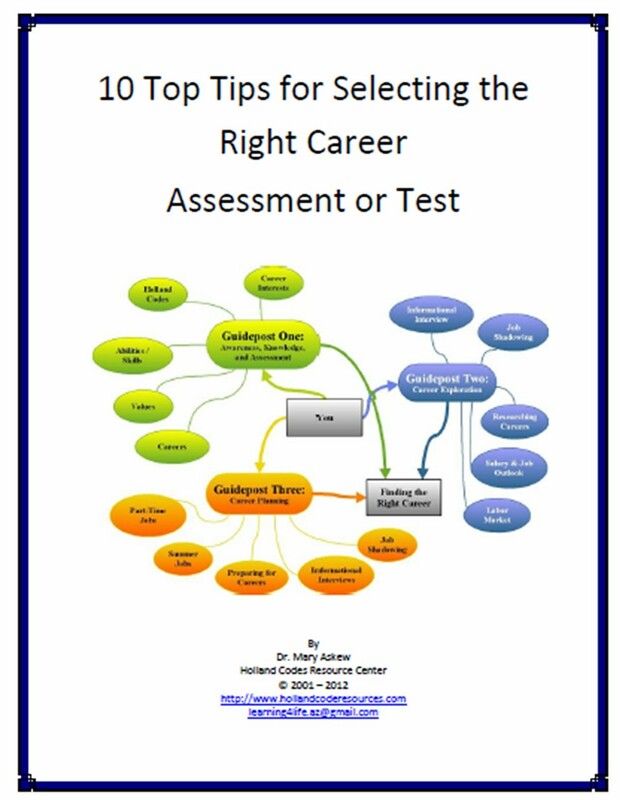 Here is information about some popular career tests. 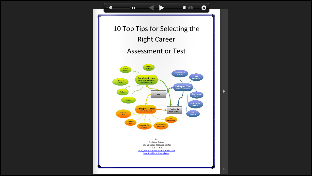 The catalog has detailed facts about career tests and other resources. Now is the time to fulfil your potential. Become aware of your interests, abilities, and skills. Match your talents to the right career. Use the checklist to determine the format, cost, and other features. The Myers-Briggs Type Indicator (MBTI) is a career assessment test and a personality test. - Step 2 is Educational and Occupational Exploration. - Step 3 is College Major Exploration. Review the different Destiny Diary career tools. 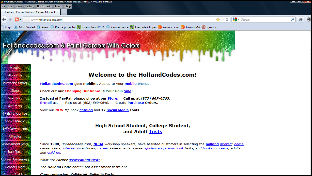 Since 1998, Hollandcodes.com has provided a variety of tools. Call us at 877-667- 6565. 1. You have the keys! The Career Test Drive is a systematic way to discover the right career and college majors. Lay a foundation. Get the facts to unlock your potential. Are you ready to move toward your destiny? 5. Set your course for the future. You need the tools to navigate on the road to self-discovery. 6. Get direction and focus. 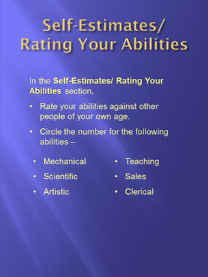 Are you searching to find your interests, abilities, skills, and talents? 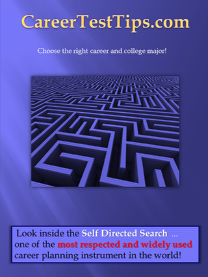 The Self Directed Search is one of the most respected and widely used career planning instrument in the world. SDS Assessment & Finder Form R is for adults and students who are interested in going to college or graduate school. SDS Assessment & Finder Form E is for adults and students who are interested in working, going to 2 year college or entering an apprenticeship. 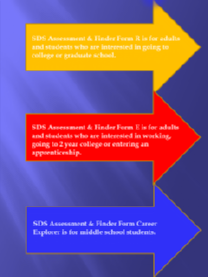 SDS Assessment & Finder Form Career Explorer is for middle school students. If you like activity, mark the Like (L) box. 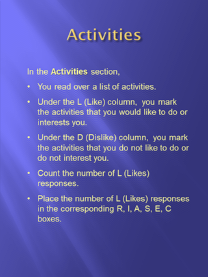 If you dislike activity, mark the Dislike (D) box. Mark Yes (Y) if you can do the skill well. 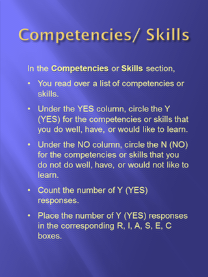 Mark No (N) if you can not do the skill or perform the skill poorly. If the career interests or appeals to you, mark the Yes (Y) box. If the career does not interess or appeal to you, mark the No (N) box. Rate yourself on each of the different traits. The ratings are from 7 (High) to 1 (Low). Now, you will summarize your results. You will enter the number from the past activities. You will total the numbers. You will enter the top three letters in the boxes. The Strong Interest Inventory is one of the most respected and widely used online Holland Code, career planning instrument in the world. Strong Interest Inventory Standard Edition is for adults. 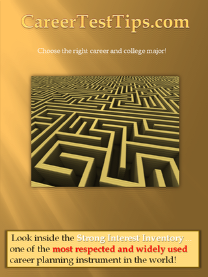 Strong Interest Inventory College Edition is for college students. Strong Interest Inventory High School Edition is for high school students. The RIASEC Inventory is an easy to use assessment. The inventory has 72 activities. Count the Likes on the 6 rows of the RIASEC Inventory. Transfer the number to the back of the inventory. In the Holland Hexagon Model, there are six vocational personalities show the relationships between Ideas, People, Data, and Things. 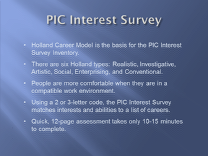 The PIC Interest Survey is a kid career test. The inventory has 36 sets of 3 pictures. There are letters (A, B, or C) under each picture. 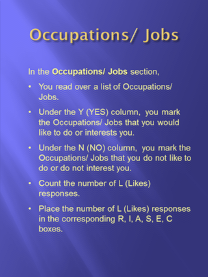 To the right of the row, there are columns labeled R, I, A, S, E, or C.
In the R, I, A, S, E, or C columns, circle the same letter – A, B, or C.
In the Occupational PICS Profile, write the totals for the R, I, A, S, E, or C letters. Under each R, I, A, S, E, or C column, put an X on the row that has the correct A, B, or C totals. Draw a line connecting the X’s. On the back page, write the R, I, A, S, E, or C letter for your highest, second highest, and third highest score. 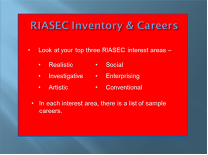 Look at your top three RIASEC interest areas and list of sample careers. The Career Locator matches Holland Code interest areas to 600 careers. 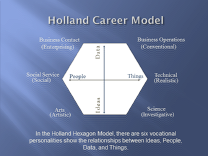 In the Holland Hexagon Model, there are six vocational personalities show the relationships between interests and careers. See Rainbow Careers is a fun way to introduce children to careers. Careers are like rainbows. The world is filled with 1000's of careers. Discover your child's career interests. Learn about how careers are broken up into six career groups. 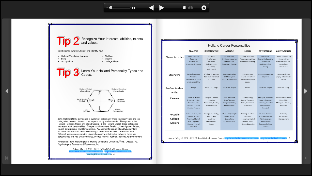 Clarifies thoughts, integrates new knowledge, and promotes critical thinking. New concepts are more thoroughly and easily understood. Improves –Attention Span and Concentration: holds audience's attention and helps people absorb information Memory Skills and Understanding: improves ability to absorb information Speed of Learning: reduces the time it takes to complete career tests. 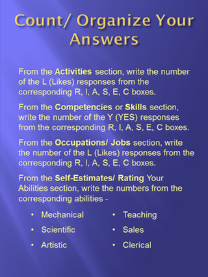 The Question and Answer Sheets is an excellent review for the information covered in the See Rainbow Careers book. 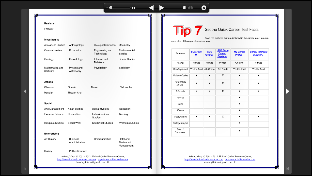 Summarize key information concurrently, or use the sheets as a review. 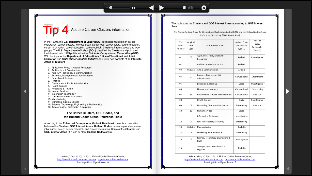 The estimated time to complete the activity sheets is 30 minutes, and activity sheets are self– scoring. Over three hundred (300) Posters feature graphics, interest areas, and careers. The Posters are Easy Scoring. You sort the posters quickly according to likes and dislikes. At the end of the poster sorting exercise, you will have your Holland Code. The posters are an excellent way to explore careers. 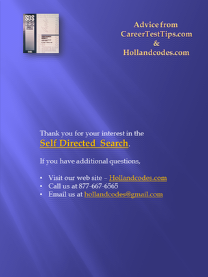 The poster shows you’re the relationship between Holland Codes and careers. We will be adding more career resources!